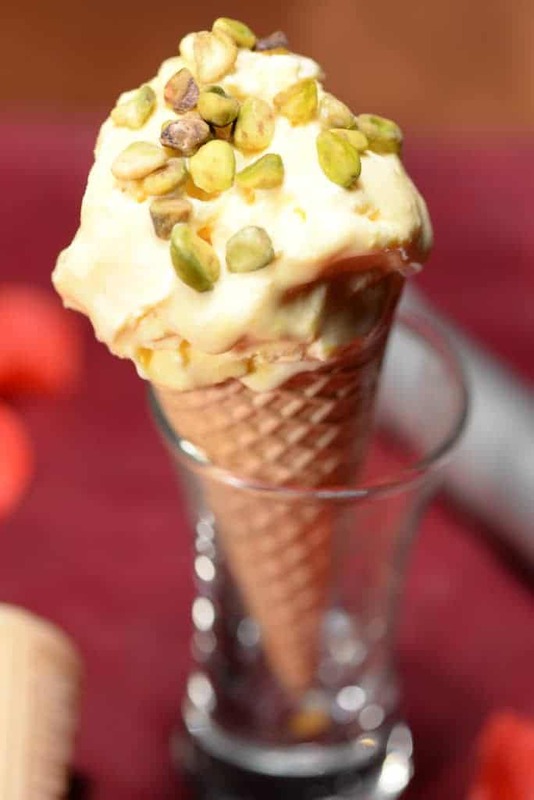 Iranian saffron ice cream is called Bastani Sonnati which actually means classical Ice Cream. Yes, Iranian Ice Cream is typically made with vanilla, saffron as well as rose water. I used a very simple way to achieve this with already made vanilla ice cream with out the use of an ice cream machine. It was absolutely delicious topped with what else but chopped pistachio nuts. Ice Cream is normally served in Iran between two very thin pieces of wafer. We enjoyed this recipe in a wafer cone. Enjoy! When ice cream has softened, place in a large bowl with the saffron mixture. Continue mixing until thoroughly combined.